Hope Bolte with new baby Milla, son Olivar and partner Adrian Stamenkovic at home soon after birth. Photo: Supplied. 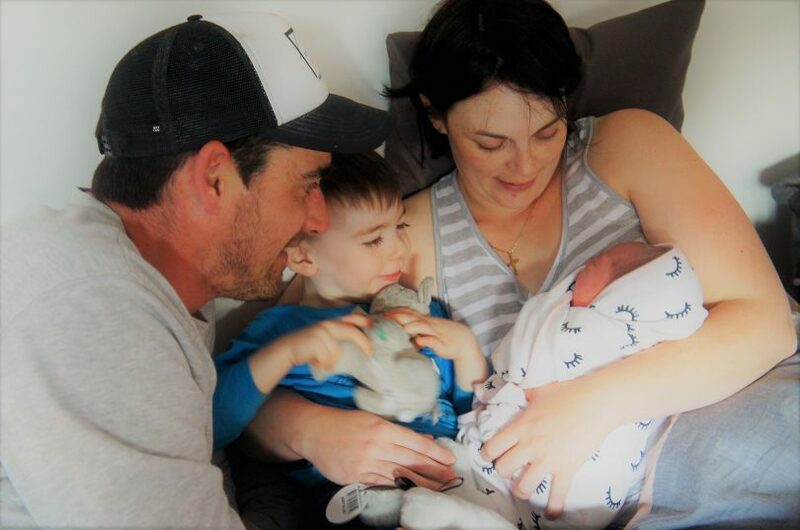 Meet baby Milla, number 15 out of 23 in the ACT’s Publicly Funded Home Birth Trial, and her family, pictured soon after she came into the world last September. The three-year trial has been criticised recently for being too restrictive and not publicised enough, and there have been calls from midwives and the Greens for it to be extended and broadened. But Canberra Health Services say the trial has had extensive reach on social media and results will be evaluated when it concludes in October. If Hope Bolte’s vote counts, the home birth service will become a permanent part of Canberra’s maternity landscape so more women can also have what she described as a safe and empowering experience. Although the hospital birth of her son Olivar was a positive one, the second time round the 31-year-old from Kambah felt more aware and in control, more comfortable with her surroundings and more supported. Her partner Adrian also felt more involved and able to contribute in their home environment. “I felt really proud of us, we both felt really accomplished, and when Milla was born I turned to him and said, ‘we did it we did it!’,” she said. When Hope fell pregnant she enrolled in the ‘Catch’ program for the Canberra Hospital birth centre and when one of the midwives suggested she was a good fit for the home birth trial it rekindled the interest she had shown reading up on it before. “My thought was it’s not a medical procedure, it’s a natural thing,” she said. She also wasn’t a fan of the hospital pillows. Adrian was less enthusiastic but once committed they decided on their birth plan, soaking up information and establishing a firm bond with their midwives. That trust and continuity of care throughout the pregnancy, birth and in the days afterward was a key difference to her first birth, where she had gone to hospital and been in the care of a stranger. “I do think that over the course of your pregnancy you do develop a lot more trust and with a home birth I found that to be a really important part, trusting you midwife,” Hope said. And if she did need to be transferred to hospital, her midwives would be with her every step of the way. “It comes down to a lot of people not being educated about it,” Hope said. She said most people assumed it’s free birthing without trained midwives and medical support or refer to negative stories in the media where someone had free-birthed and something bad had happened but there was not a lot of positive stories. For Hope, her midwife Ann lived close by in Weston Creek, monitored her in the days before the birth when Hope felt a few pains and on the day in question checked her at 9 am, returned about an hour later when called, followed by the other midwife Chrissy Foy, and Milla arrived at 12:30 pm. The midwives stayed for another four hours to make sure all was well and the baby was feeding. Being at home meant the comfort of her own bed, own pillows and little disruption to the rhythm of the day. There was no break in labour to pack up and go to hospital, where she would have had to readjust to new surroundings. And no packing up again to go home. Son Olivar returned from daycare to be greeted by his new sister, not having to stay elsewhere or go to the hospital. Hope believes her recovery was a lot quicker than her first birth, and the next day she felt really good and rested. “It allowed us to get back into normal everyday life quicker and adapt to our new life,” she said. With hospital able to be reached within 20-30 minutes from most areas of Canberra, Hope believes the home birth catchment area could be widened and she would like to see water births offered as long as someone experienced was available. But the criteria also reassured her that the process would be safe, with the intention to reduce risk. She said the trial did need to be better publicised as she would not have pursued it without her midwife suggesting it. Hope’s only ‘gripe’ was that she couldn’t hang on to her midwives for longer after the birth. They maintain contact for seven to 10 days but Hope would like to see that extended. “It’s like having your aunties in the room afterwards,” she said. For any women interested in finding out more about home birth, there are information sessions coming up at Centenary Hospital for Women and Children Birth Suite (Building 11, Level 3). The next information session will be on Friday 29 March from 5:30 pm to 6:30 pm.